When life gets tough or you get stressed the idea of going on a retreat can seem like heaven. You may wish you could spend the day or a week in a spa or health retreat but that is not always possible in the ‘real world’. 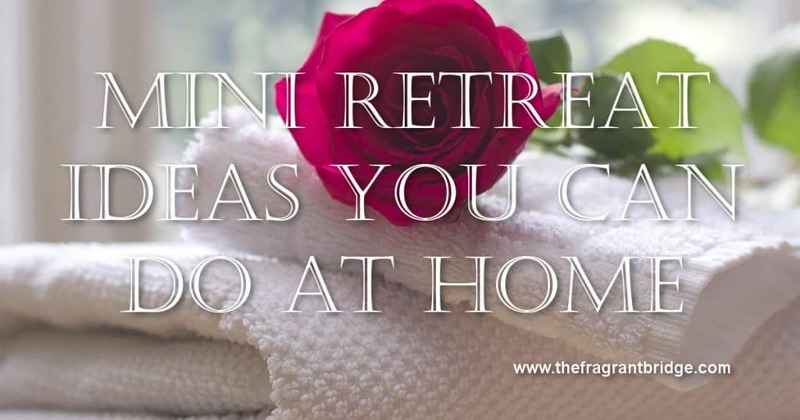 You may not be able to afford the time or expense to visit a health retreat but you can give yourself a mini retreat experience at home. It can be as short as an hour or two or as long as a day or weekend. Below are some ideas to give yourself time out and nourish yourself so that you can come back refreshed, more productive and better able to cope with the ‘real world’. 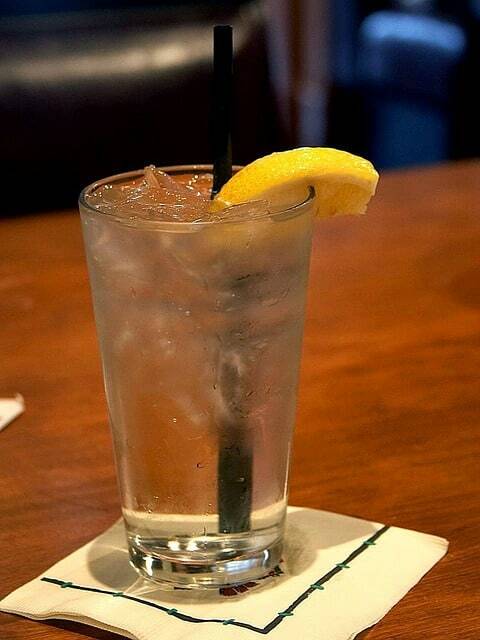 Begin the day with a glass of water with the juice of a lemon added to begin detoxing your body and then go for a brisk walk, run, swim or other exercise you enjoy. 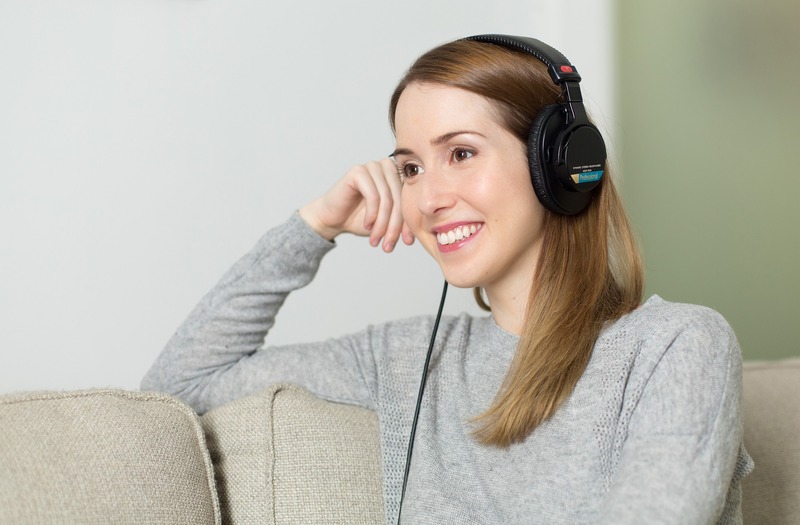 This could be made into a family activity and could be as short as 15 or 30 minutes. Eat a healthy breakfast on your return. Take time to read something enjoyable, meditate, walk on the grass barefoot, listen to music or other activity that you find relaxing. You may choose to do it outdoors but if indoors you can vaporise some relaxing essential oils such as lavender, geranium, bergamot, marjoram or uplifting oils like lemon, sweet orange, mandarin, lime or grapefruit. You can place about 6 drops in a diffuser to perfume the air. Have a bath with 4-6 drops of essential oil added to the warm water and swished about with some soothing music playing in the background followed by a massage can be very relaxing. Add the essential oils to half a cup of full fat milk before adding to the bath so the oils will disperse through the bath water. Perhaps apply a face mask while you’re enjoying your bath. Apply a scrub to your skin and wash off in the shower followed by some moisturising lotion or oil to which you have added your favourite essential oil blend. 60mls salt, 30mls jojoba oil, 5 drops grapefruit essential oil and 10 drops frankincense essential oil. Combine the salt and jojoba directly in a 120ml PET plastic jar. Add the drops of essential oils and stir vigorously with a spoon. Use a small handful while you’re the shower or bath to scrub away dead skin and soothe muscle aches. Avoid use on the face. Rinse well. The lingering layer of jojoba will provide long lasting moisture. Have a massage or if there is no one nearby give yourself a neck, shoulder, arm, hand or foot massage. One recipe you can try is lavender 3 drops, geranium 2 drops in 10 mls cold pressed vegetable oil or if you don’t like lavender try Australian sandalwood 2 drops and grapefruit 3 drops. Go on a picnic either at home or to your favourite spot. Have lunch or brunch with friends. Do something creative like drawing, making jewellery, writing poetry, journaling, making a video or whatever gets your creative juices flowing. It doesn’t really matter what you do as long as you take time out of your daily routine to have fun and nourish yourself physically, mentally and emotionally so you can reduce the stress in your life and feel happy to be part of the ‘real world’. Make these mini retreats a regular part of your life. This entry was posted in Essential Oils and tagged mini retreat, relaxation, spa day, time out on November 23, 2016 by Carole Hodges. “Smell of rain, smell of spearmint, smell of soil. I prefer to use spearmint rather than peppermint for children. There are also adults who prefer her to peppermint as she has a gentler aroma and energy. This is due to the different chemical constituents of spearmint and peppermint. Synonyms: Common Spearmint (M.viridis), Garden mint. Aroma: The aroma is similar to but less potent than peppermint. Colour: Pale olive to pale yellow. Plant: Grows to 75cm in height with oval or lance shaped bright green leaves. Slender spikes of small aromatic white, pink or lilac clustered flowers appear from summer to early autumn. It has a system of underground runners that grow outward from the buds situated at the base of the stem. If the roots are not contained it will overwhelm other plants and rapidly crossbreed with other nearby mints. Main Growing Areas: Native to the Mediterranean but grown in many countries with the USA being the largest producer. Major Constituents: Carvone, limonene, linalool, 1.8 cineole. (-)-carvone gives spearmint its typical aroma. As with other oils the aroma can vary due to differences in temperature, humidity, soil fertility and time of harvest. 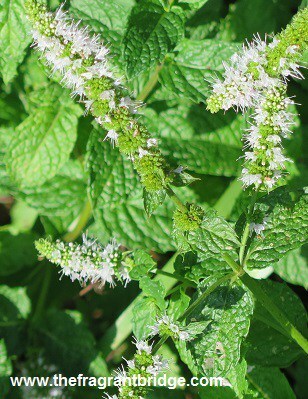 Spearmint contains very little menthol in comparison with peppermint. 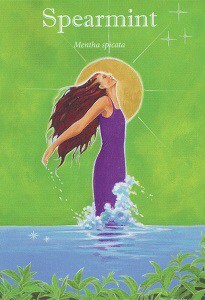 Interesting snippets: The ancient Greeks used it in their bath as both a tonic and scent. The Romans introduced spearmint into Britain where it was used it to stop milk from curdling. In medieval times it was used to heal sore gums and whiten teeth. Mentha comes from the Greek meaning mint or the Latin mente meaning thought. Spearmint is thought to be the oldest of the mints and named spere mynte in the 16th century. Part of Plant used /Extraction: Flowering tops and leaves. The plants are usually harvested after the plant has flowered but before the seeds have ripened. Steam distilled from the flowering tops but the leaves and stem can also be steam distilled. The process can take between 35 and 50 minutes. Therapeutic actions: Alleviates digestive disorders, nausea, wind, constipation, diarrhoea. Relieves hiccups and nausea by relaxing the stomach muscles. Can also be used for travel sickness. Because of her anti-inflammatory, decongestant and expectorant properties she is good to use as an inhalation at the first sign of a cold. Research has shown spearmint to be effective against both gram+ and gram- bacteria and fungi and so could be considered in a blend for infected skin. Emotional and Spiritual: Mental stimulant that cools and uplifts, good for tired minds, mental fatigue, lightness of being, stress induced nervousness, nervous exhaustion, soothes the nervous system. 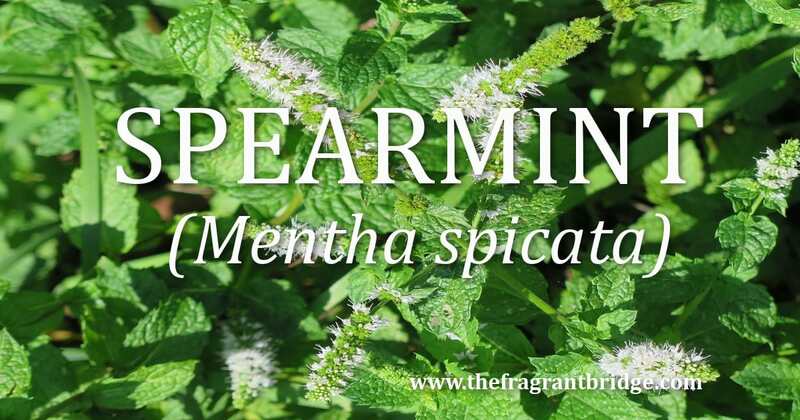 Spearmint invigorates all levels of our being. Fresh and tingly, cool and soothing, Spearmint lifts heavy emotions and helps keep a clear intention to preserve and utilise your energies efficiently. Live the invigoration that Spearmint can bring to your life. Safety: Non-irritating, non-sensitising. Advisable not to use neat on children under 18 months of age. This entry was posted in Essential Oils and tagged mental stimulant, nausea, nervous exhaustion, spearmint essential oil, stress, tired minds on November 9, 2016 by Carole Hodges.